On a warm and drizzling summer day, a friend and I kayak the wild, scenic and remote Waccasassa River near Gulf Hammock, Florida, west of Gainesville. Despite the wet, cloudy conditions, we find the paddle to be quite enjoyable, and we plan to return again. In fact, during the trip I note that it was extremely surprising to me that this hidden gem is so close to my home in Gainesville yet I have never heard much at all about the pleasures it holds. 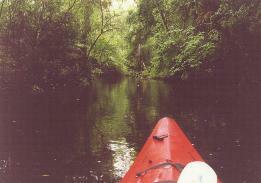 The river is quite narrow where we put in—averaging approximately 25 feet across, which is perfect for kayaking. 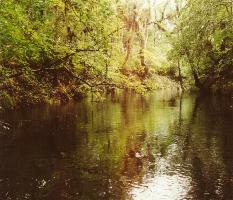 It is a blackwater river fed, at its headwaters by Blue Spring in Levy County in a woodland area called Devil's Hammock. Several small springs feed the river from its limestone banks, but most of the flow comes from rainfall. The river is lined with a very attractive stand of oaks, very large cypress trees, black gum, willow, and pine. Mostly, the river banks are entirely undeveloped. The lands on its banks are owned by the Florida Department of Environmental Regulation, Georgia-Pacific, and Nekoosa Packaging Company. The paddle is one of the most quiet I have ever done. There is almost no road noise, and we do not see a single person during the entire trip. Along the way, we notice fairly steep limestone banks (by Florida standards) along the sides, and the river is relatively swiftly flowing (again, by Florida standards). At several points, we squeeze through small, fast-moving "whitewater" riffle zones where the river is constricted by logs or other obstructions. Large felled trees require us to portage over or bend very low to get by. Many small, spring-fed creeks seep into the river from its banks, at times creating mini-waterfalls. We see a number of large waterfowl. I also spot a curious otter and a large, 3-4 foot long fish breaks water next to my kayak (either a tarpon or an Atlantic Sturgeon). I regret not having paddled this superb river before. As I said above, I intend to return to this well-kept secret, particularly to check on conditions upstream and downstream from where we paddled. 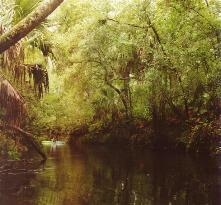 The name "Waccasassa" is believed to be a Seminole Indian phrase meaning "where the cows are" or "cattle range." The river flows southwesterly and passes the town of Gulf Hammock before emptying into the Waccasassa Bay and the Gulf of Mexico. 22 of its 29 miles are considered navigable. Most of the land along the river is part of the Waccasassa Bay State Preserve, a National Landmark, or owned by timber companies. Threatened species along the river include the Florida Willow.